This entry was posted in Trend Alerts on May 8, 2018 by Impress. Thanks for stopping by today. 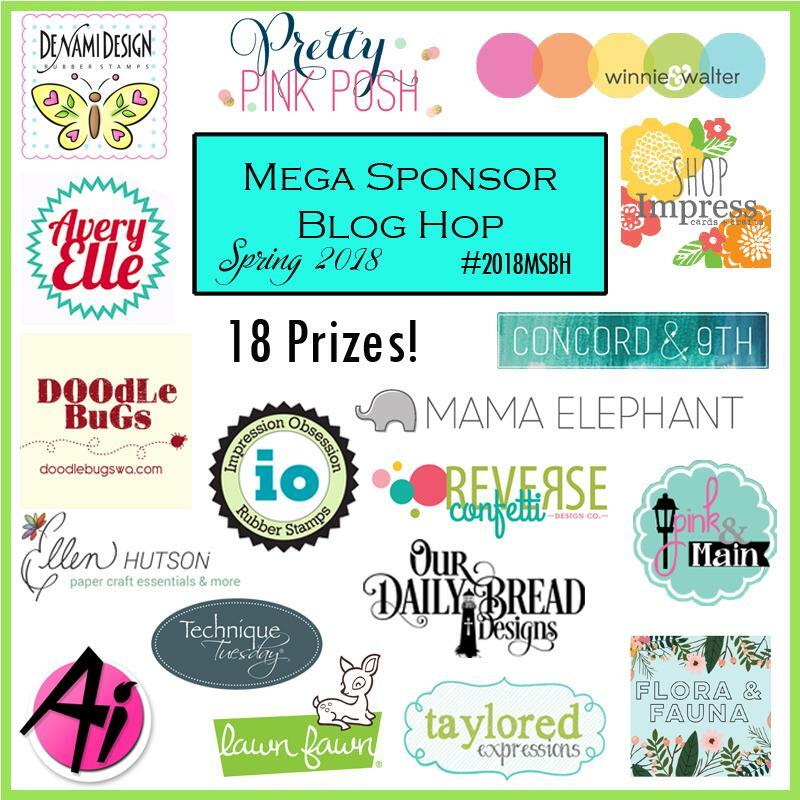 We think it's so fun to be a part of the Mega Sponsor Blog Hop. Here's a project we wanted to share. 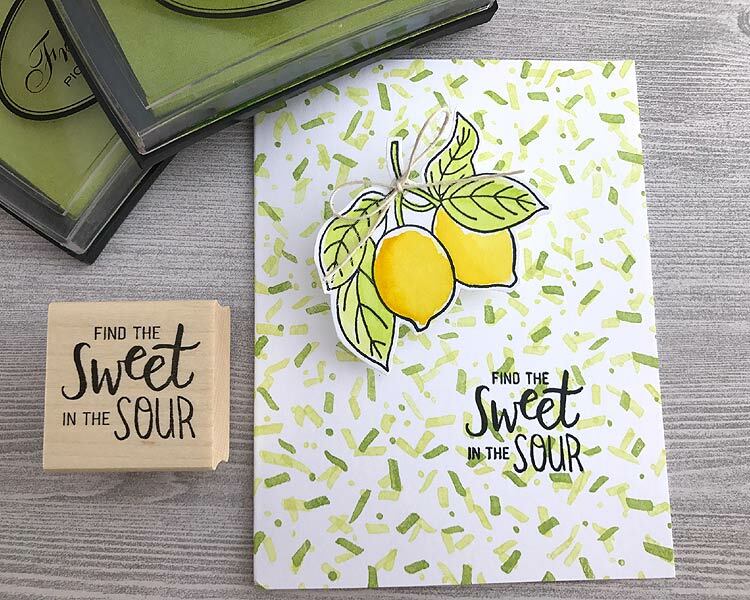 It uses three of our new rubber stamps including one of our favorites the lemons. We added the background with our confetti stamp. 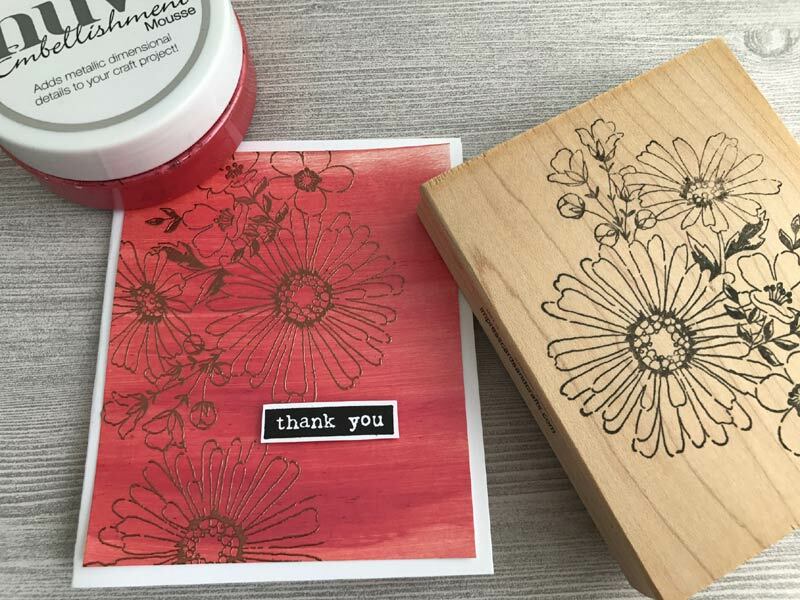 It's a really versatile stamp and we've already used it on so many different cards. Here we stamped it with different colors to make the background. We used Fresh ink celery and limeade. 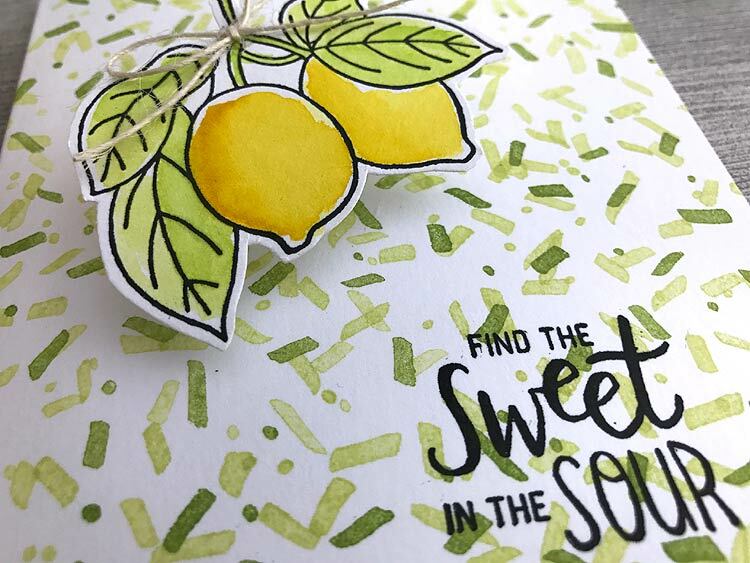 The lemons were water colored, cut out and then attached to the card with a mini wobbler. Enjoy! This entry was posted in Trend Alerts on April 23, 2018 by ann. This entry was posted in Trend Alerts on April 16, 2018 by ann. This entry was posted in Trend Alerts on April 10, 2018 by Impress. Coming Soon” blog post and on social media. Mark your calendars! 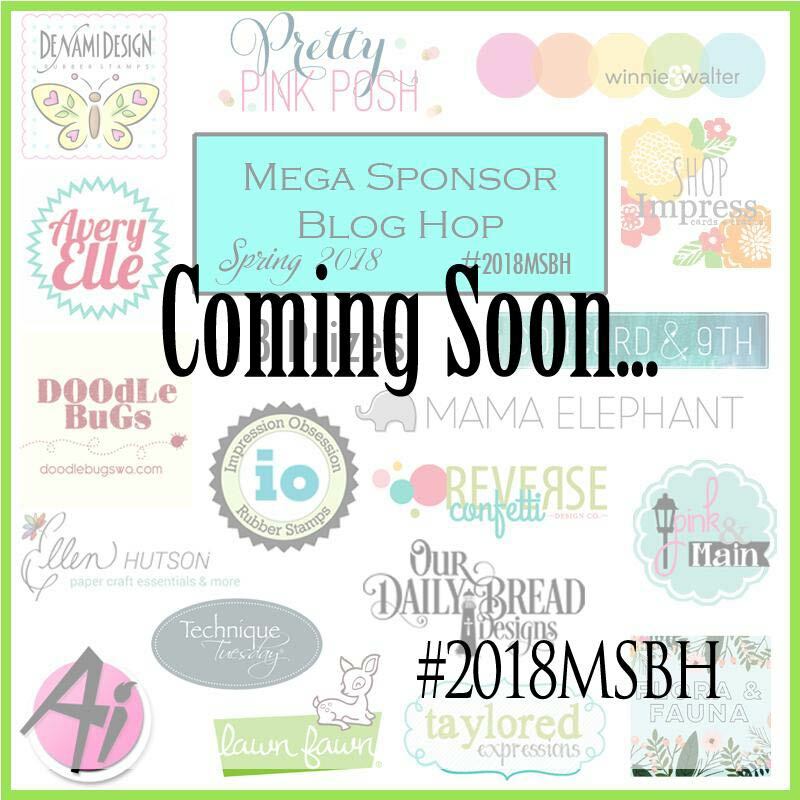 We are so excited to be part of the upcoming 2018 Mega Sponsor Spring Blog Hop! The feedback we got from last year’s was incredible and are excited to be part of this again. We have 18 sponsors giving out prizes totalling over $550! Don’t miss out, so be sure to subscribe and follow us in this exciting event. This entry was posted in Trend Alerts on April 9, 2018 by ann. 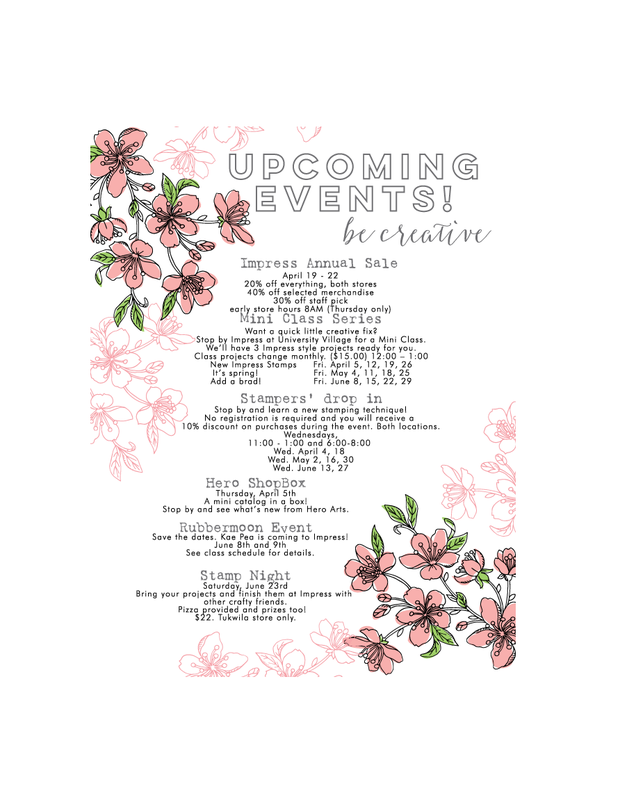 We have Stampers' Drop In today at both of our locations! 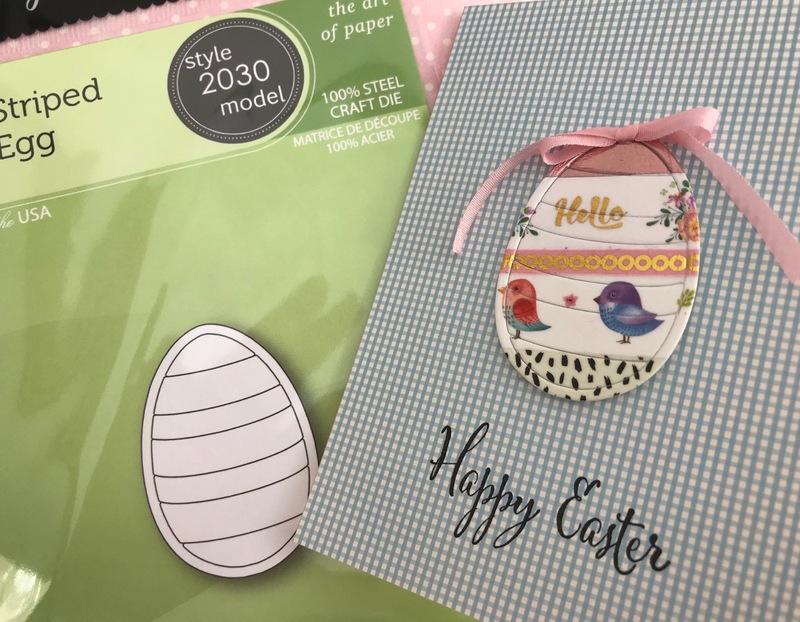 Today at Tukwila they will be making this fun card using a Memory Box die that you won't want to miss! Stop by between 11-1 or 6-8 to make this fun card. This entry was posted in Trend Alerts on March 21, 2018 by Impress. 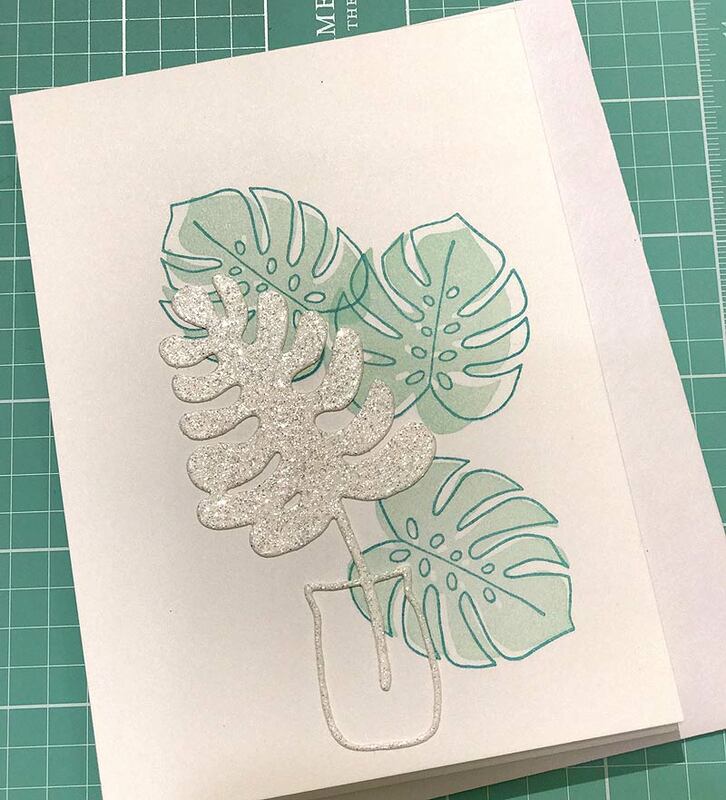 Jeannie Glenn taught this card during her recent glitter card class and she's letting me share this fun technique with you! 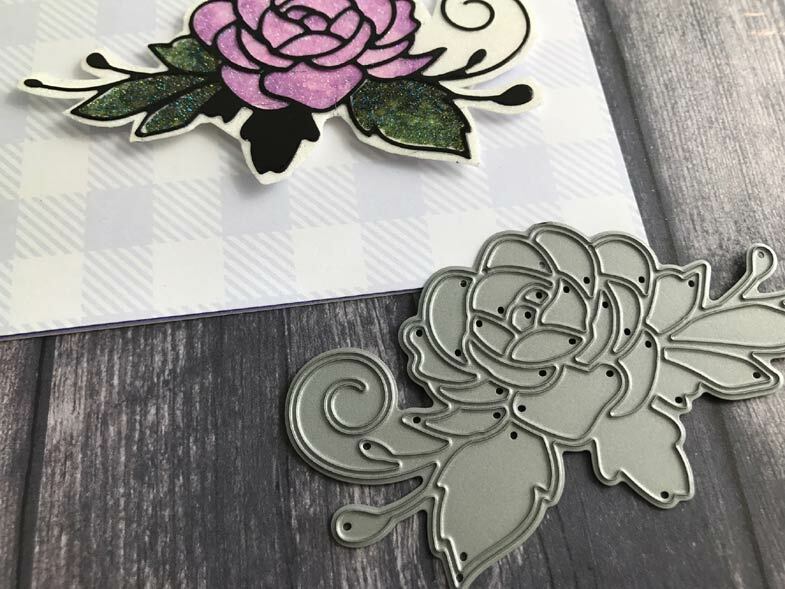 Instead of the usual black stickers used for this technique, Jeannie diecut black mirror paper with a die from Poppy Stamps called blooming rose. She attached the glossy die cut to a piece of a score tape sheet and then covered the whole thing with microfine glitter. 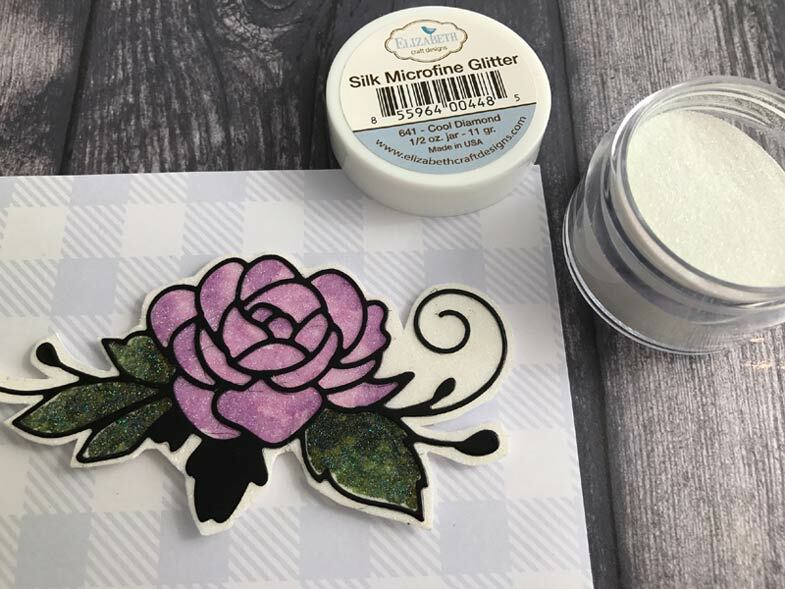 The glitter only sticks to the adhesive so at this point the rose is black and white. Color was added to the glittered sections with copic markers. This entry was posted in Trend Alerts on March 13, 2018 by ann. Big news. 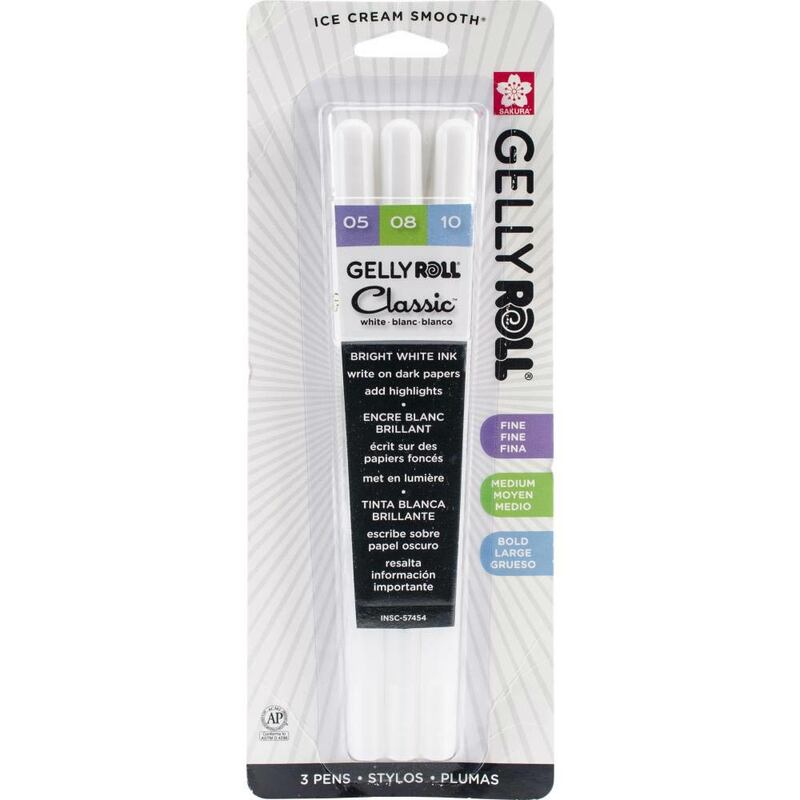 We now have white gel pens in 3 different point sizes, fine, medium and bold. We're so excited. 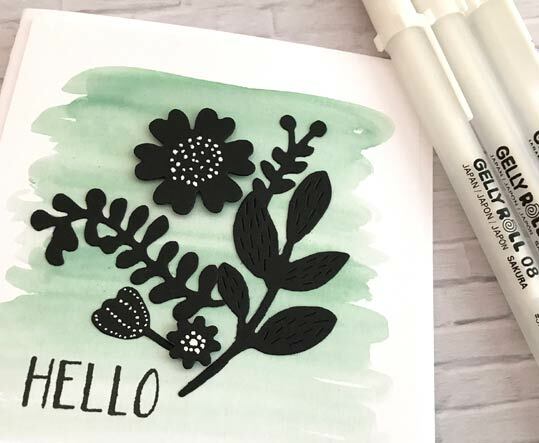 Whether you're embellishing a stamped design, adding color to a die cut like this one from Flora and Fauna or doodling from scratch, you'll love having these pens. This entry was posted in Trend Alerts on March 8, 2018 by ann. 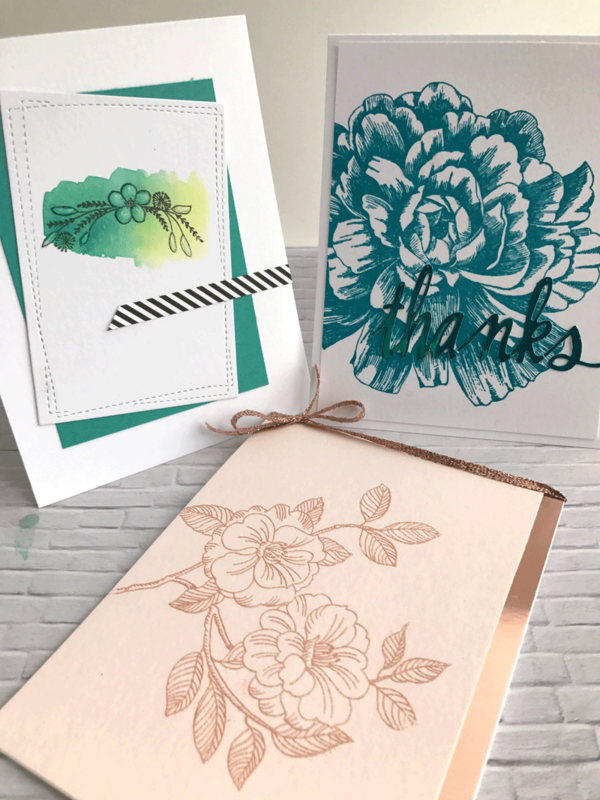 Let’s bring spring early by making 6 beautiful floral cards using stamps, dies, ink techniques and lots of sparkle and shine! This class is taught by Whitney Henne. 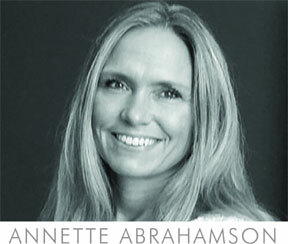 ($30.00) Call 206.901.9101 to preregister. We love Avery Elle products at Impress. 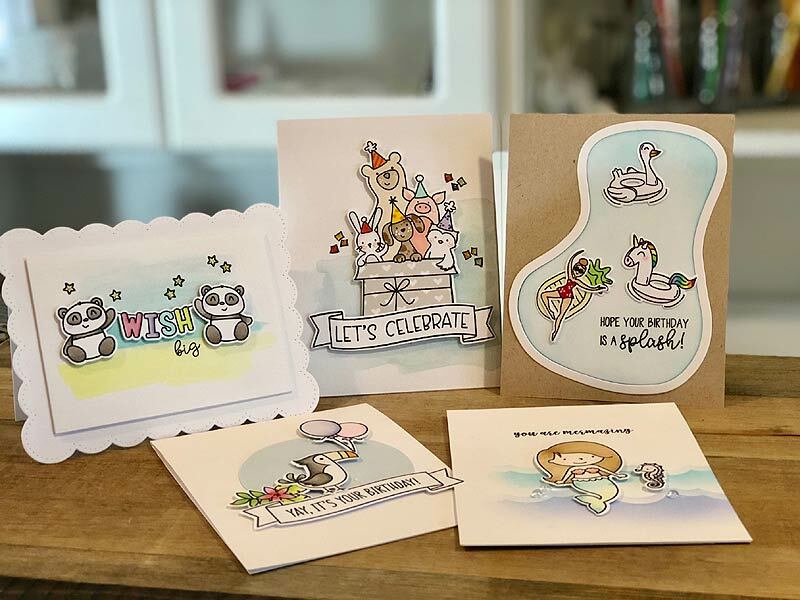 Join Heather Campbell, one of their designers, and make 5 creative cards using their latest and greatest stamps and dies. 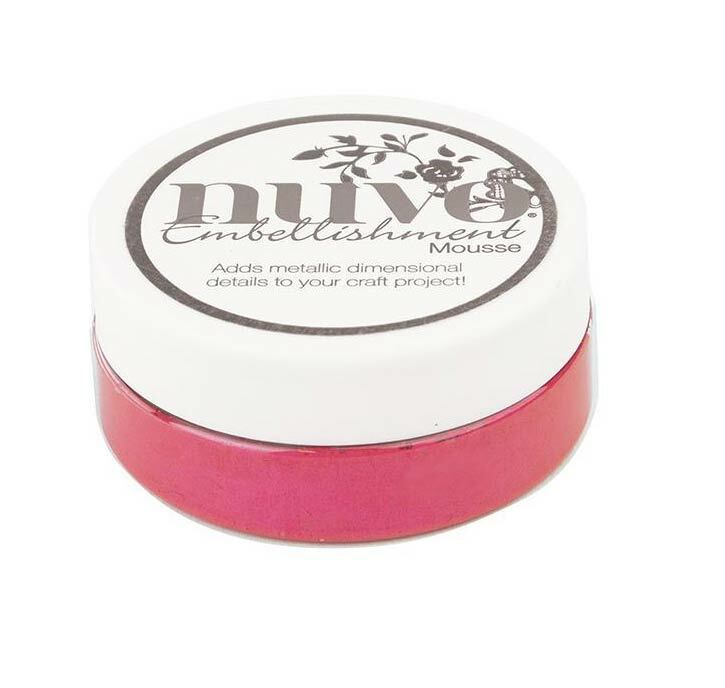 ($35.00) This class is at our Tukwila store this Sunday from 12 - 2. Call 206.901.9101 to hold a spot. Bring your colored pencils or copic markers to color. You'll also get a chance to use Avery Elle's new liquid watercolors. Hope to see you there.